Special hours: Above are sales hours. Thank you for choosing Petersen Chevrolet Buick in Fairbury, Illinois. As your Chevrolet Buick dealer, Petersen Chevrolet Buick is here to provide for your every automotive need. Find out what it means to buy a GM Certified Used vehicle from Petersen Chevrolet Buick. Contact us to schedule a test drive today! Petersen Chevrolet Buick is located in Fairbury; this makes us a favorite destination of Bloomington Buick and Chevy shoppers as well. You’ll find our selection is the best in the business, but the reason we're the dealer of choice here in the Fairbury Buick and Chevy community is our dedication to excellent customer service. We look to please every guest visiting our store, whether they buy from us or not. Illinois Chevrolet customers make the drive from all over the state to shop with us, and we keep them coming back with our extensive inventory and good old-fashioned courtesy. If you’re looking for a Bloomington Chevrolet and Buick service center then visit our service department at Petersen Chevrolet Buick. We’re dedicated to maintaining your vehicle's optimum performance, and our convenient location in Fairbury makes us accessible to drivers from all of the nearby communities. Use our website to schedule a service appointment, order parts, or find tires and accessories for your GM vehicle. At Petersen Chevrolet Buick, our service department is staffed with ASE-certified technicians. No matter what your needs, Petersen Chevrolet Buick in Fairbury, Illinois is here to assist you. 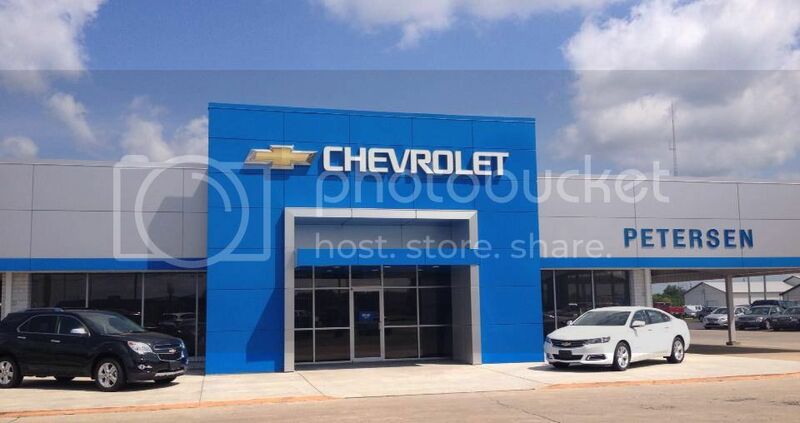 We are a family owned and operated Chevrolet-Buick store. The business was started in 1954 by Mike's grandpa in Anchor, IL and in 1987 Mike and Marc opened a Chrysler dealership in Gibson City, IL. Over the years, Petersen's has built their business by serving generations of customers and providing quality service to the surrounding communities.